Happiness in a box – For the fainthearted . . . The receiver was hanging down from the telephone. 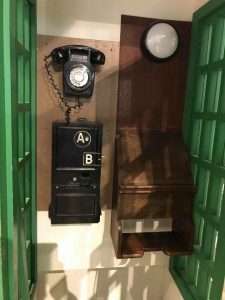 Stepping aside from the steady moving flow of people, I opened the door of the phonebox and set the receiver back into its cradle; you wouldn’t know who might be trying to call. Unlike telephone boxes in former times, there seemed no-one waiting to make or receive a call, it was odd that the receiver had been hanging. The Posts and Telegraphs telephone box in Terminal 1 of Dublin Airport stands beside a postbox of a similar vintage, reminders of a world almost unimaginable for those born in the Twenty-First Century. A colleague in his mid-50s was visiting a school where one child asked him if it was true that, when the colleague was young, people had to know where you were if they wanted to phone you. There was amusement among the class at the thought of such a necessity; they probably wondered how you would know where a person was if you couldn’t phone them to ask their whereabouts. Despite the contemporary quaintness of phone boxes, despite them being thought worthy of being placed in an airport terminal as a museum piece to be observed my millions of passengers, the phone boxes must hold a dear place in the hearts of many of the people who used them. Privacy was not a strongpoint. Everyone could see who was using the telephone and could speculate as to whom they were calling and what might be the nature of the conversation. If they were nosey, or impatient at waiting to use the telephone themselves, they might stand close enough to the box to overhear what the person inside was saying. And it was not just the inquisitiveness of those outside the box that was a problem, a bored operator might sit and listen to exchanges, ostensibly to tell the caller that their three minutes was complete and that they needed to insert further coins. Despite the expense of using it, Button A might have to be frequently pressed; despite the potential intrusions upon one’s privacy; despite the inconvenience of having to go to stand in a metal and glass box at the roadside in order to call someone, the phone box was cause for joy. It allowed the opportunity to talk to someone, the calls might have been brief, they might have been inconsequential, but they allowed ordinary people to hear each other’s voices. 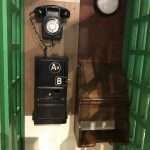 The phone box at Dublin Airport may evoke memories of conversations at the most significant times in people’s lives, and, for those of a certain age, they may evoke thoughts of happiness.